I only started contemplating my identity when I was around 30 years old. I was working as an assistant director in an advertising production house and every time someone asked me what I did, I had trouble spelling it out. I wasn't really into my job, I kind of just did it in the hope of working as a director one day and maybe feeling fulfilled then. I had also recently gotten married and felt super awkward describing my relationship status. I am from a small town in Bihar, a state that the rest of the country looks down upon. Kind of like the red neck of America. I didn't give a damn what people thought of my background but I had left the town when I was 11 years old for boarding school in Rajashthan, all the way on the west coast of our country. I didn't really feel like I identified with anyone back home or for that matter, people in my school. I had spend my college years in America and identified with a lot of my friends there. So when someone asked where I was from and what I did, it would result in a super long, winded monologue that left my audience confused. But over the years, I made a few changes and have narrowed a few things down. I am a baker, a feminist, a woman with a mishmash of Indian- American cultural beliefs, struggling entrepreneur, clumsy, terrible keeper of secrets, life enthusiast, reluctant resident of Bombay and a rebel in progress. I am also obsessed with dark chocolate and pretty sure I need to disclose that bit as soon as I meet someone. These cookies are a good way to make my introduction. I love Edd Kimber and stalk him on every social media platform so when he posted a recipe for these cookies, I decided to bake them the very same day. They are super simple to bake and the only thing you need to keep in mind is that the quality of chocolate and dutch processed cocoa powder is great. I loved the fact that this didn't require any chilling and you can have fresh cookies straight from the oven in under 25 minutes (that includes the cooking time!). 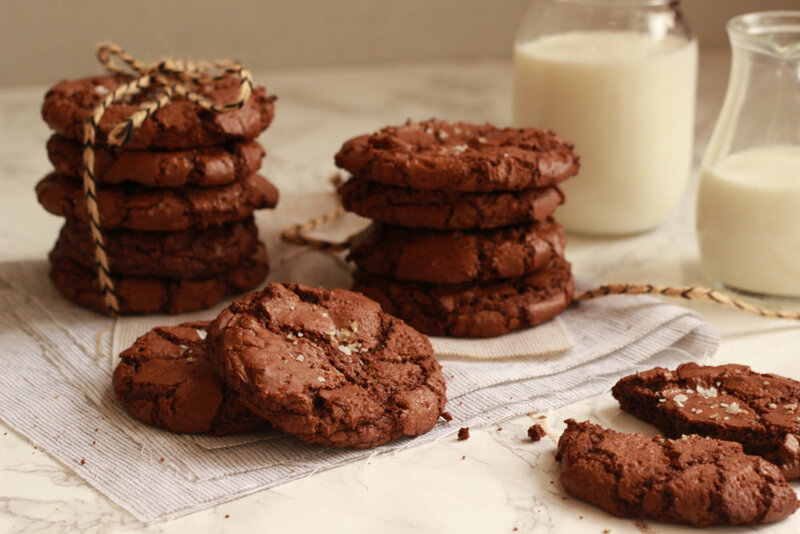 I have tried a few versions of brownie cookies but these are by far my favourite, intensely fudgy, rich in chocolate flavour and delicious. I would recommend a glass of milk to wash these down with.